As Barry goes on trial for the murder of Clifford DeVoe, Joe and Iris must decide how far they're willing to go to free Barry as Barry considers revealing his secret identity as The Flash to the world. Meanwhile, the rest of Team Flash must deal with a new metahuman who emits radiation. Barry's argument that he can't reveal his secret identity because it would place Iris and everyone at STAR Labs in danger doesn't really hold water. Ignoring that they're all part of a superhero team that routinely face down dangerous metahumans and that half of them are metahumans, police officers or super-geniuses with access to advanced weapons, most of the most dangerous enemies they've faced already know who they are. Reverse Flash? Zoom? Savitar? The Thinker? Heck, most of the metahumans in Central City who were held in The Pipeline in Season One can probably identify Cisco or Caitlin as "those guys who brought us our meals." Joe's plan to plant evidence in The DeVoe house is idiotic considering that he should know full well that The DeVoes have a security system, with cameras, since that is what captured Barry breaking into their home back in 407. On that note, doesn't it seem odd that The DeVoes have security cameras but not a door alarm that is triggered by Ralph opening their front door? Fallout's generation of 3000 rads is far worse than Harry and Cisco let on. A dose of 1000 rads is considered to be incurably fatal to a normal human. 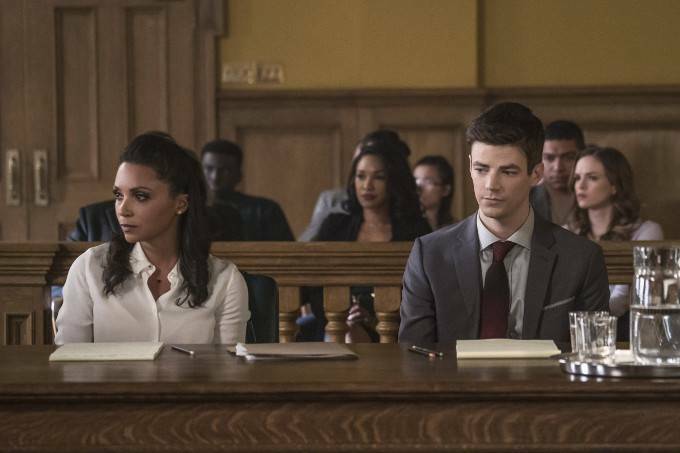 While there may not be any law that requires Barry Allen to be present for the closing statements at his trial, it does seem odd that he'd be allowed to leave the courtroom considering he's supposed to be under house arrest! What the heck was Barry running into the middle of a radiation-filled area supposed to accomplish? Somehow, Cisco is unaffected by Fallout's radiation despite standing closer to him than the police officers who passed out trying to build a cordon around him. How is Barry allowed to walk off, unattended, in the middle of the courthouse? So the police saw The Flash run into danger to deal with the radioactive man but they didn't see Killer Frost and Vibe? Or did they just not think they deserved an award? The episode takes its title from a classic Flash storyline - The Trial of The Flash - which ran for over two years from The Flash #323 through The Flash #350. The Trial of The Flash closed out the Barry Allen The Flash comic, leading into Crisis On Infinite Earths. The story saw The Flash put on trial for murder, after he snapped the neck of The Reverse Flash while trying to prevent him from killing Barry Allen's then love-interest, Fiona Webb. It is worth noting that The Trial of The Flash storyline introduced the character of Cecile Horton, who acted as The Flash's defense attorney. This version of Cecile Horton was a Caucasian woman with red hair who worked as a lawyer in private practice, as opposed to the Cecile Horton of the DCTVU, who is employed as a district attorney in Central City and is of African-American heritage. The prosecutor trying the case against Barry is a man named Anton Slater. This was also the name of the prosecuting attorney in the original The Trial Of The Flash story. Neil Borman aka Fallout first appeared in The Flash: Iron Heights (August 2001) and was created by Geoff Johns and Ethan Van Sciver. A stone-mason by trade, Borman was working at a nuclear power plant in Central City when an explosion during a test caused him to fall into the reactor cooling system. This triggered his metagene, altering his molecular structure so that he was transformed into a being made of high energy electrons - in essence, a walking nuclear reactor. Borman was unaware of the danger he posed, until his wife and son died from radiation poisoning. Borman turned himself into the authorities and was sent to Iron Heights prison, where he was turned into a power-source for the facility against his will. The Flash discovered this and arranged for STAR Labs to develop a more humane method of treatment for Borman. The DCTVU version of Fallout has the same powers, name and was similarly oblivious about his nature as a metahuman. Rather than a stone mason, he is a truck driver who hauls nuclear waste. Barry is able to briefly allow Iris to perceive things as quickly as he does as he moves so quickly that nobody sees him move when she tries to tell the court that he is The Flash. In the comics, Wally West developed the ability to lend his speed to other people or drain the speed from other objects in motion. Harry Wells refers to Earth-15 as being a dead Earth. This is generally true for most versions of Earth-15 in the DC Comics cosmology. The pre-Crisis On Infinite Earths Earth 15 was home to a race of stone giants. The post-Infinite Crisis Earth-15 and New 52 Earth 15 were both originally near-Utopian worlds which were destroyed by Superboy Prime. Barry Allen's fingerprints and DNA are found on Clifford DeVoe's body. Cisco hacks the monitoring anklet that Barry is required to wear while under house-arrest so that it will always show him either being at Joe West's home or the courthouse..
Cisco now has a hand-held device that he can use to scan for dark matter residue to detect if a metahuman had been within the area of a crime scene recently. Caitlin notes that all the victims at the bank were suffering from fatigue, vomiting, abdominal pain, skin rashes - all symptoms of radiation poisoning. This also explains why the security cameras at the scene of the bank were fried. Harry says the levels of radiation generated by the metahuman at the bank are high enough that he could potentially become a living nuclear bomb. Cisco uses the STAR Labs satellite to track Fallout's radiation signature. Fallout's radiation signature is measured at 3000 rads when he first notices his own powers. To put that in perspective, whole body dosages of 1000 rads are considered invariably fatal. Cisco says that 10,000 rads will result in a Hiroshima level disaster. Barry: My name is Barry Allen and I'm an innocent man. Joe: Ralph! Hold up. Listen, I'm not going to let Barry go to prison. I failed his dad. I'm not going to fail him. I need your help. Ralph: My help, huh? As in the, uh "stretchy" kind? Joe: As in the under-handed private investigator kind. Ralph: Oh. Ha! No offense taken. Iris: Why are you so hell-bent on destroying our lives? The Mechanic: I am doing what I have to do for my husband, Mrs. West-Allen. The question you should truly be asking... is what are you willing to do for yours? Iris: I would rather run forever with you than stand alone without you. Cisco: The city is about to explode! Everyone, everything you know and love - the birds, the trees, the fish! The puppies! Puppies are going down because you didn't want to show up for work! Harry deduces that Dominic Lanse's power must have given DeVoe an outlet for taking-over his body. This is indeed what happened in 409. Iris makes reference to Barry's gibberish talk from when he emerged from The Speed Force in 401. Specifically how he said something about not killing anyone. Cecile Horton takes a leave of absence from the Central City District Attorney's office to act as Barry's lawyer. The Mechanic is uncomfortable with the thought of her husband being in a new body. The prosecutor refers to Barry's breaking into the DeVoe home in 407. Captain Singh is called to testify against Barry at his trial. Captain Singh says that he hired Barry Allen over CSIs with twice as much experience because Barry was more concerned about helping the victims of crimes find closure than prosecuting criminals. Reference is made to Barry having taken a six month sabbatical to the Czech Republic. This was the excuse used to explain where Barry was in the gap between Season Three and Season Four. Barry was late for work 72 times in the past two years. Ralph takes pictures of The Thinker in his new body kissing The Mechanic. She later claims that Domnic Lanse acted as a sexual surrogate, with her husband's approval, after he was no longer able to see to her physical needs because of his disease. Barry is somehow able to lend his speed to Iris so they can have a conversation while the rest of the room is frozen in time, relatively speaking. Ralph can stretch is finger-tip into a key-shape to unlock doors. According to Harry, Earth-15 is a dead Earth. Barry Allen is found guilty of murder in the first degree. Fallout is sent to Tracy Brand's lab to see if his DNA matches that of the bus metas. The Flash is given a special award for heroism at the same time that Barry Allen is sentenced to life in prison. Barry is locked in the same cell that belonged to his father, Henry Allen, in Iron Height's Penitentiary. See Goofs for multiple examples of how stupid everyone was in this episode. Simply the worst. Our heroes act like idiots. The villain isn't really a villain and his subplot only seems to be here to pad out the episode. The trial is completely unengaging because Barry doesn't even bother to mount a defense and if the hero can't be bothered to take the trial seriously, why should we? And Killer Frost and Vibe deserve that plaque more than The Flash, dammit!